Refer a friend and you'll get $50*! Your bonus potential is UNLIMITED! *Certain criteria must be met. See an Account Manager for details! Click here for office locations, directions and printable forms such as timesheet, tax forms, I-9 and other employment related forms. TSI Enteprises offers full-time contract employment with competitive wages and a robust benefits package. 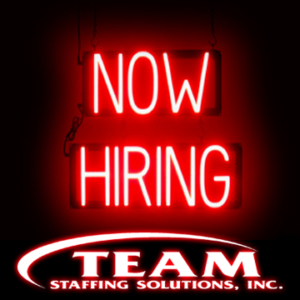 Team Staffing Solutions is a full-service staffing firm. We offer solutions in staffing, recruitment, on-site management, testing and background screening.